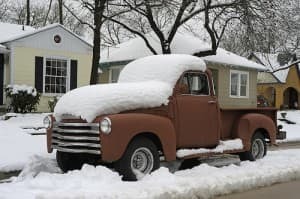 Knowing when to use your 4wd in the snow and ice can be very useful to stay on the road! Your owners manual will generally explain what type of 4wd your vehicle is equipped with. Some vehicles will have a push button 4wd, some will have a shifter in the floor board, and the very much older vehicles that have the wheel lock 4wd. Most manufactures will provide detailed information on when and where it is best to use your 4wd. But for those whose vehicle did not come with an owners manual, due to being a used vehicle, here are some helpful hints about your 4wd and when it is best to use it. Read carefully and if needed call your vehicles local dealership with any questions or concerns. High Range 4wd, or 4-high, allows you to drive full speed, if needed. The high range 4wd ratios are the same gear ratios that the vehicle has in 2wd. The best time to use 4 high is when additional traction is needed on terrain that is not very steep. 4 high is good to use on snow, ice, and muddy roads. Or even when your not operating on paved roads, such as rocky; gravel roads. As well as when your possibly stuck in sand, or on snowy and slippery icy conditions. Low Range 4wd, or 4-low, alters your vehicle gearing ratio. 4 Low was made so that your vehicle will creep at a slow speed, and that will also reduce the risk of damage to your vehicle. Manufacturers prefer you to keep your speed under 45mph while using your low range 4wd. Remember that 4 low DOES NOT give you more traction, but then it does provide a considerable amount of more torque, usually about two to three times more than that of 4 high at very slow speeds. The optimal time to use your 4 low range is on wet smooth roads or landscape, such as in wet and heavy snow. Or when attempting to ascend and descend steep hills on very rough landscape, like taking trails or off driving road. When tearing through mud, climbing rocks, and powering through deep sand or water.